Posted on July 28, 2017 | 6036 views | Topic : News & Articles, Property News. Melawati Mall presents eight retail floors with over 250 shops across a net lettable area of 620,000 sq ft. 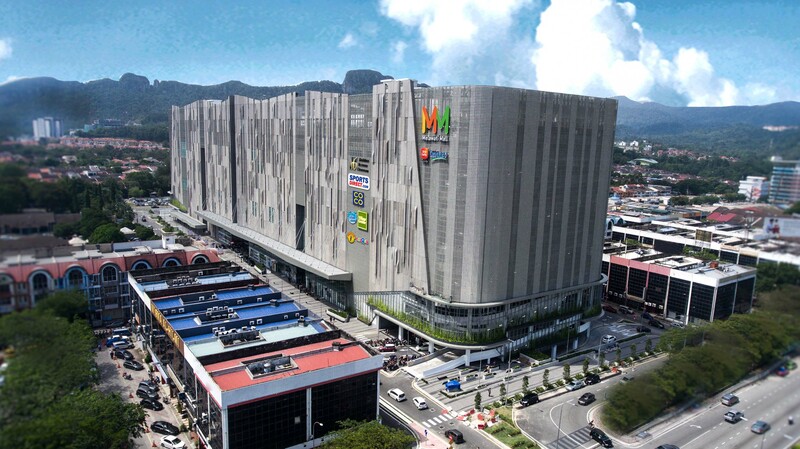 According to statement, this iconic mall can serve an estimated number of 740,000 people, serving neighbourhoods in Taman Melawati, Taman Melati, Wangsa Maju, Bukit Antarabangsa, Ukay Heights, Kemensah Heights and other surrounding areas with 1,900 parking bays. Melawati Mall is conveniently accessible from Middle Ring Road 2 (MRR2) or 15-minute bus ride from the Taman Melati, Wangsa Maju and Sri Rampai Light Rail Transit (LRT) stations. The mall is certified as a Green Building Index (GBI) building with a rainwater harvesting system, energy-efficient lighting, air cooling systems and environment-friendly features. The focal point of the new shopping mall is the LED façade wall, a design that is meant to evoke the image of Tabur Hills. A 773-sq-ft family room located at Level two is well equipped with fundamental facilities such as three nursing rooms, family toilets, diaper changing room, resting area, water dispenser and designated play area. Moreover, anchor tenants include Golden Screen Cinemas, Village Grocer, Padini, Brands Outlet, Coco, Next, FoodEmpire, Toys “R” Us, MPH, KidsZone , Kaison, Sports Direct and Mr DIY, to be followed by Fitness First, Yubiso, SenQ, Daiso, Homes Harmony, Tony Roma’s and many more. Cognisant of its targeted Malay patrons, Melawati Mall has designated a zone on Level 2 for brands like Ashura, Aura Raja Sehari, Rina Salleh, Siti Khadijah and Tucz to form a collective of retailers specialising in Muslimah and Malay ready-to-wear fashion, a sector which has boomed in recent years. Apart from that, dining options range from established restaurant chains to new-to-market brands like Wayback Burgers, an American franchise whose first Malaysian outlet will be in Melawati Mall. Adding to the variety are home grown restaurants such as Troka Coffee and Be Sixth, both of whom have staked their claims on Level 6 where a cluster of F&B outlets with spacious balconies. It is an ideal spot to take in a meal and a panoramic view of the world’s longest quartz range, Bukit Tabur. Melawati Mall centre manager Kow Shih Li said, “The mall is well received by retailers and we are greatly encouraged by the support, especially during these challenging times. Occupancy is set to exceed 80% by the end of the year. “We are glad that Ms Read is on board and scheduled to operate in October including much-loved favourites such as a new Thai food concept, grocer with the widest range of fresh produce in Malaysia, halal dim sum restaurant, an ocean-themed indoor children’s playground, gourmet bakery, a food court, and cinema”, Kow added. In conjunction with the opening, Melawati Mall has started engaging with the public online since June 2017 with more than 8,000 registration to the opening campaign, www.melawatimallopening.com. Ten thousand gift vouchers and on top of that five winners will walk away with a total of RM5, 000 cash vouchers each. The public can still register before the campaign expires on September 15. From July 26, Melawati Mall welcomes shoppers with a colourful mini town with fun games and activities for the whole family. Shoppers can enjoy free parking in its opening month. Jointly developed by Sime Darby Property and CapitaLand Malls Asia, this new shopping haven positions itself as a lifestyle hub for the greater Melawati area. The Melawati township development master plan spearheaded by Sime Darby Property includes corporate office suites, luxury condominiums and upgraded public facilities with Melawati Mall as a catalysing component of its urban redevelopment initiative.